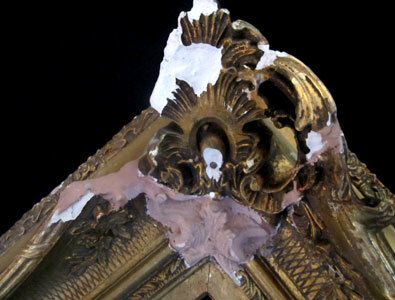 Frame Masters offers frame restoration service to your antique frames and artworks. Restoring an antique frame requires the expertize that only come with years of experience. We have the capability of repairing only part of the damaged area and retouching it to match the frame, or completely restore the entire frame and gild it to its original glory. Have a frame that looks like this? We can restore it to it's original condition.